Bringing together luxury and comfort, the Blue Star restroom trailer creates an oasis for party-goers and construction workers alike. These easily transportable restroom facilities are equipped with unrivaled design and innovation to surpass all expectations with versatility being key. This 5-stall restroom facility combines beauty and cutting-edge functionality to provide a climate controlled escape. This 28′ restroom trailer also features seven stalls and two urinals to ensure patrons are in and out as quickly as possible. 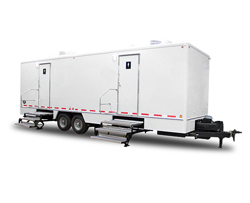 This 28′ restroom trailer features stately amenities such as stainless steel sinks, porcelain toilets and two flushing urinals. At the forefront of trailer innovation lies the Blue Star 2802, showcasing some of the latest advancements in portable sanitation. This 24’ restroom trailer was built tough with comfort and durability in mind, perfect for construction or industrial applications.